We're a streaming video family. We don't have cable. I'm not sure I even know where the remotes to use the 'regular tv' boxes are. When we want to watch something on tv, we use the Roku upstairs, or the Wii downstairs to stream it from either Netflix or Hulu Plus. I like that Mims isn't exposed to a lot of commercials, and I can control what is played on the tv. Jake and I both like that the cost is less than $20 a month. I watch a lot of documentaries at night, after Mims goes to bed, and I am sitting crocheting. I watch documentaries on everything: comedians that died too soon, world religions, puppeteers, environmental causes, historical mysteries, I watch it all. Jake thinks I'm nuts, and that I should just curl up with a nice romantic comedy and wind down at night (um, sometimes I get very upset by the injustices in the world...), but I'd rather know, you know? So, the other night I was watching Bag It, a documentary by Suzan Beraza, that began as the story of plastic bags in our environment, but then spread to include all plastics in our world, and what it's costing us as a global community. It had a powerful message that really resonated with me. I can do more. I can do WAY more. And it's my responsibility, as a citizen on this planet, to do it. A great way to start is to bring your own bags. I know, I know, we've been hearing this for years, but seriously, every time you use your own grocery bag, you're changing the world! 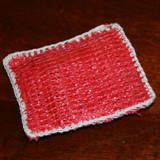 It's a Reversable Dish Scrubber! Awesome, right?! You can find the pattern for it on Mrs. Greene! 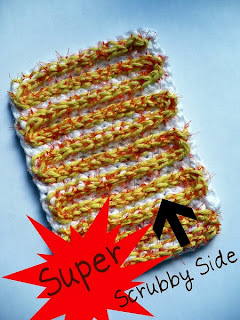 There's also THIS amazing crochet pot-scrubber on Crochet.About.com! Who knew all these recycle-friendly crochet projects were out there?! 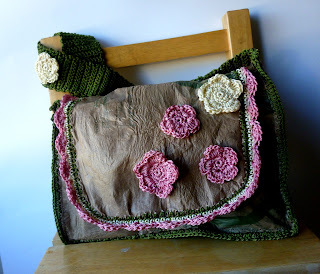 I made THIS messenger bag last summer out of grocery bags and nylon yarn. I didn't put the instructions for it up at the time, but maybe if you guys were interested I'd show you the process I use to fuse the bags, and then how I turn them into something. Let me know in the comments below if we need to do a recycled craft week... :D I promise, there will be crochet involved in all of it. Okay, so find your fave pattern, grab your hook and yarn and watch Bag It on Netflix tonight. It's amazing to think that we can make such a difference in the world we live in! Even if you don't want to do it for me, do it for the Sea Turtles. **Sometimes I write my posts a couple of days in advance. It keeps me organized. But it means that I sometimes have to do an update to the information, since I'd like it to go out as my most current version of my thoughts. I feel like I have to give a warning (? not sure if that's exactly the right word, maybe caution would be better) about the documentary. Um, I'm a really emotionally sensitive person (I believe that overly-sensitive is a descriptive phrase that comes out in family arguments...) and I have found it almost unbearable to go out in the world knowing the damage that plastics are doing to the environment. I've now boycotted two of our favorite restaurants, because they use Styrofoam cups. I almost had a meltdown in the grocery store because of all of the plastic packaging. I know what you must be thinking, I'm a wacko-lunatic (you're right) but I feel like I need to warn the other emotionally sensitive Dynamos (comes with the creativity, we're in touch with nature) that if you're the type that becomes distressed after watching March of the Penguins, or An Inconvenient Truth, you may want to pass on this one and just continue taking your eco-friendly bags to the grocery store. It really DOES make a difference.